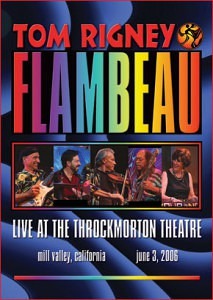 This full length live concert video was shot in June of 2006 at the beautiful Throckmorton Theatre in Mill Valley in front of a high-energy crowd of Flambeau fans. 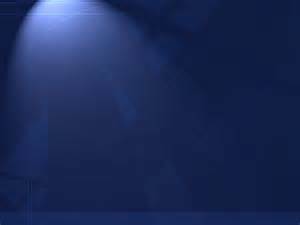 The DVD contains over 75 minutes of music, all shot in broadcast-quality digital video–six cameras and a crew of thousands! 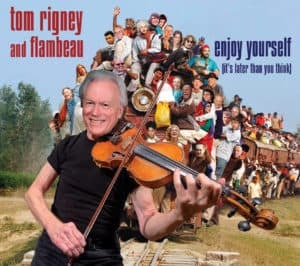 The disc contains many favorite songs and tunes from the Flambeau repertoire, including “Swamp Feet”, “Mazatlan”, “Party Gras”, “Moonlight on the Bayou”, and a roof-raising version of “Jambalaya”. 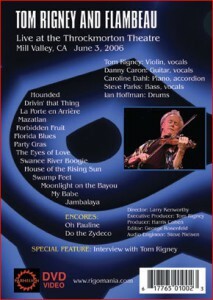 Also included on the DVD is an in-depth interview with violinist/composer/bandleader Tom Rigney, offering a few glimpses behind the curtain of his musical life and history.